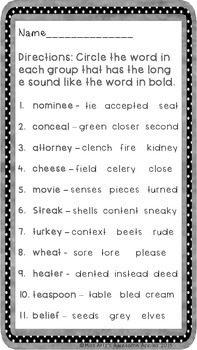 Do your students have trouble with decoding and encoding words as they read? 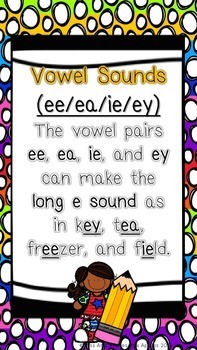 If so, this is the fifth of twenty four phonics activity packets, which includes several worksheets and an activity to assess students' understanding of each phonics skill. 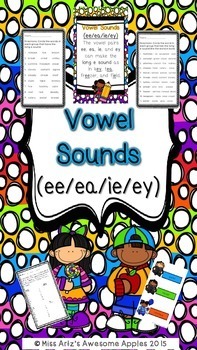 In this particular set, students learn about the vowel pairs ee/ie/ea/ey, while completing three worksheets, and completing an activity. The three worksheets have answer keys included in this product. 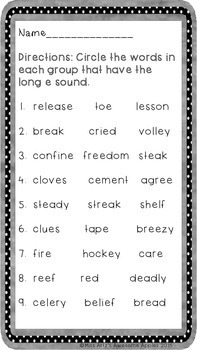 In the activity, students take children/word cards, and they group the items according to their long e sound spelling pattern. Once they have each of the items grouped, they record their answers on the recording sheet provided. Finally students may check their work with the answer key provided.